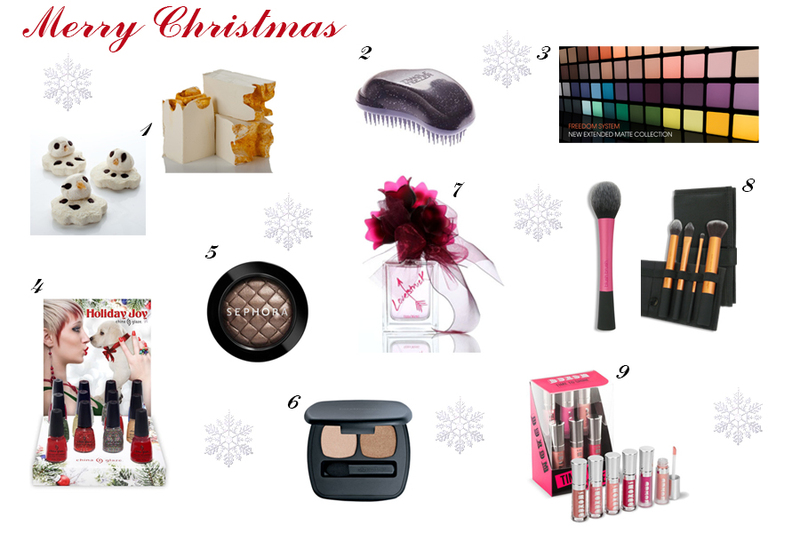 Carousel Coral: Christmas Beauty Wishlist! I was in a very festive mood this past weekend, so I decided to make my Christmas beauty wishlist and write a post about it. I know Christmas is one month away, but I couldn't help myself, I had to do it! 1. Lush Holiday Collection. For the past 4 years I always end up buying some of their gorgeous smelling stuff. Since we don't have Lush in Greece, I place an order from their UK site. My number one essential is the Snowcake soap, smells like an almond heaven, the same smell has the Snowman Melting Bath Melt which I love! 2. Yep, a Tangle Teezer! I don't know why it's in my Christmas wishlist and why I've never bought it before but for sure I'm going to get it now. I really like the purple one with the silver glitter! 3. Inglot eyeshadows. I've been lemming Inglot eyeshadows for over 6 months, but I'm gonna treat myself with some of them this Christmas. I keep hearing how pigmented they are, I'll propably get a 5 pan palette with my favorite kind of eyeshadow shades, neutrals! 4. China Glaze Joy Holiday Collection. I'm such a polish addict, and I love Holiday collections. I've already bought some from the OPI Skyfall collection, and I also wanna get some from China Glaze too. The whole collection looks amazing with all these gorgeous reds and golds, Merry Berry, Cranberry Splash and Champagne Kisses are the ones I want the most. 5. Sephora Prisma Chrome Outrageous Metallic Taupe Eyeshadow. I saw these new metallic eyeshadows at the french Sephora site, and I fell in love with the taupe one, and I'm not even a taupe eyeshadow lover! It looks so pretty and metallic, I bet it will look amazing on the lids on its own with just black liner and mascara. 6. bareMinerals READY eyeshadow duo. Yes I know, too many eyeshadows in my wishlist but I checked these duos at a Sephora store a few weeks ago, and I loved them. They are so soft and pigmented, and the neutral shades they have are amazing. A little on the expensive side but I hope I'll find a good deal at Sephora till Christmas time. 7. Vera Wang Lovestruck perfume. I like buying a perfume every Christmas, last year was Givenchy's Dahlia Noir, this year I hope it will be Vera Wang's Lovestruck. It smells amazing, not heavy at all, perfect for everyday. I believe that Vera Wang's perfumes are amazing, I already love the Princess. 8. Real Techniques Make Up Brushes. I've never try them before and I've being lemming them for months. The ones I want the most are the Blush Brush and the Core collection. 9. bareMinerals Buxom Time To Shine mini Lip Collection. This lipgloss set is the one I'm lemming the most from my Christmas wishlist. When I saw it at Beautybay's site I was like "I have to get it now!". I read really good reviews about Buxom lipglosses and I think that this set is just perfect for me to try them out, it contains shades that I use the most. I'm not sure if I'm going to get them all, but a girl can dream! What's on your Christmas beauty wishlist? tangle teezer is in my wishlist too!I'm between the purple and the pink one!Oh and the vera wang parfume smells great! I hope you can buy them all!!! And if not ... that's ok because a girl can always dream!!! I want to try this tangle teezer too, seems that everybody likes them! I've recently bought 2 Real Techniques and I like them so far (review coming soon). Wait, which OPI Skyfall polishes did you get?? Photos pleeeease? LOL I'll do a haul post soon, I got Casino Royal and Tommorow Never Dies.